Right after the holidays I began noticing a change in my behavior and daily attitude. No one told me I had to eat all of the holiday chocolate within a month of receiving it! Turns out, processed sugars have been proven to strain the body’s immune system and reinforce mood swings. After limiting my sugar consumption, there was an immediate change. Considering it is flu and gloomy-sky season, I’m not about to take more chances. It’s amazing that a little diet adjustment can alter so much! These apricot slices make a perfect snack by themselves or an addition to breakfast. 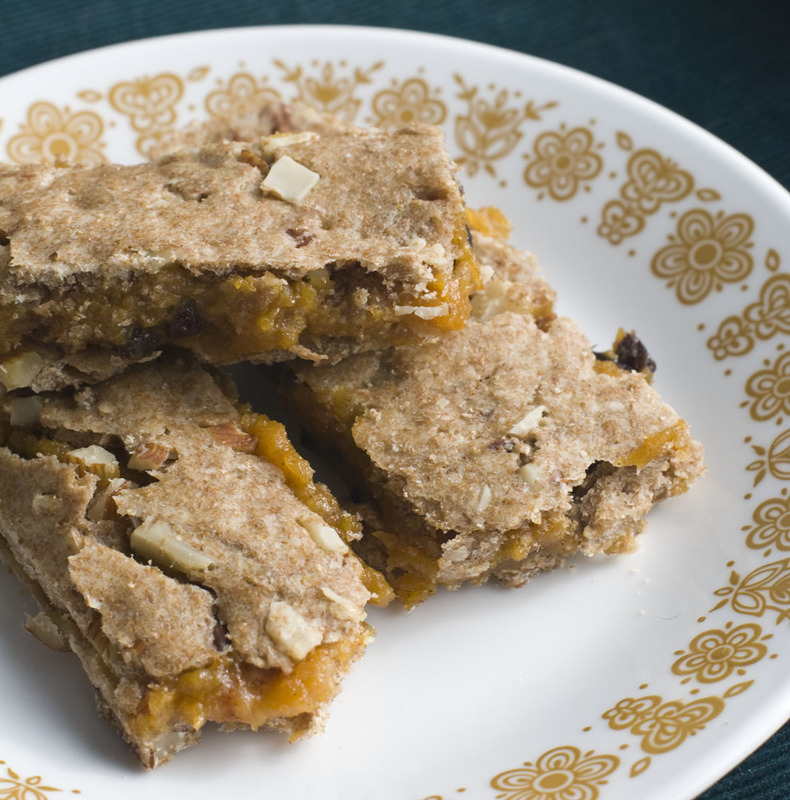 Not only are they made without refined sugar, they provide a boost of fiber and vitamin C! Yum! 1: In a large bowl, mix together flour and nuts. Cut in the margarine until the mixture resembles a bread crumb texture. Stir in water to form dough. Cover and chill for 30 minutes. 2: In a medium saucepan, add apricots, zest and apple juice. Bring to a boil, then reduce heat and simmer for 30 minutes or until the apricots become soft and mushy. Remove from heat. All fruit to cool somewhat, then purée. Fold in cinnamon and currants. 3: Remove dough from fridge. Preheat oven to 400°F. Place parchment paper in an 8×8-inch square baking dish. 4: Divide dough in half. Roll out half into the shape of the baking dish. Line the dish with the dough, pressing along the edges so that the entire bottom is covered. Spread the purée over the first layer of dough. Roll out remaining dough and gently cover the apricot spread. Prick with a fork and brush the top layer of the pastry with milk. 5: Bake 20-25 minutes until golden brown.